On a recent sunny spring afternoon, Nishanga met with Kimber Simpkins, a yoga instructor, positive body image teacher, and author of Full and 52 Ways to Love Your Body. The venue was Sanctuary Bistro in West Berkeley. 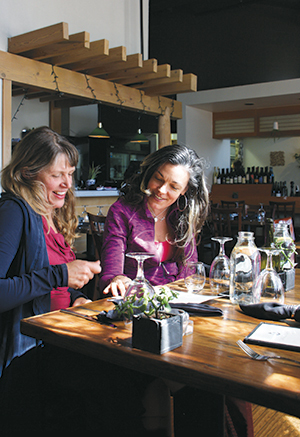 Along with Cheryl Angelina Koehler, editor of Edible East Bay, who joined them to photograph, they enjoyed BLTs and citrus trifle as they discussed the topic of pleasure in relation to food. Kimber: Tell us about your research into pleasure and food. You’ve studied peak eating experiences … what are they? Nishanga: While working on my doctorate in nutrition, I noticed that the nutrition world had a lot of anxiety around pleasure and some phobias around food. A lot of American nutrition advice stems from early practitioners like Kellogg and Graham [of corn flakes and crackers fame] in the 19th century. You’d go to their [sanitarium] and eat whole grains and vegetarian fare with the aim of curbing masturbation and promoting health. The idea was that food shouldn’t be too pleasurable because it’s sinful. Right there in the early development of nutrition is the advice that you can’t enjoy your food—you don’t want to make it too tasty or you’ll eat too much. When I saw this distrust of pleasure, the fear that overindulgence leads to being overweight, I thought, “Let’s look at that, is that really true?” So with pleasure as the object of my research, I wanted to ask about the highest pleasure people experience while eating. I wondered, are they like the peak experiences that [Abraham] Maslow talks about? Could an eating experience be transcendent? What makes something a peak eating experience? I started out by asking 12 people to describe their peak eating experiences, one in the last two years and one in their lifetime. From those results I derived an online survey and ended up with 400 stories of various peak eating experiences. While analyzing it I looked at the top ten words that appeared. They were taste, cooking, company, fresh, love, flavor, friends, family, wine, and special. In those ten words you start to see the meaning of food, the social expression, and the relationship with love. And how do we get the love in there? So many people talked about being able to taste love—“a meal freshly cooked with love.” Fresh is a flavor also, and research shows that it’s just the right amount of sourness [that lets us] know it’s fresh. And then there’s the social meaning in words like company, wine, friends, and family: Many peak eating experiences were celebratory meals, like a holiday dinner out or a feast. Wine adds value and financial status too. Brian Wansink, who wrote Mindless Eating: Why We Eat More Than We Think, does research on food and what leads us to overeat. In his test restaurant one night he offered free wine with your meal. He got Two Buck Chuck: Half the room got it relabeled as California’s Finest Wine and the other half as North Dakota’s Finest Wine. The people who had the “California” wine liked their food more, spent longer eating it, and would pay more for it. It’s really powerful to see that while just about any wine enhances a meal, if you think the wine is better, it enhances it more. It was also interesting to see that out of the 400 peak eating stories, less than 1% were “junky” food, while more than 95% were fresh, local, seasonal, and made from scratch. In general, peak experiences are not coming from processed food. K: What got you interested in studying pleasure and food? N: It’s funny: In the nutrition world, eating for pleasure is considered the lowest relationship to food and eating, and then you move on to higher relationships. Ed Bauman considered eating for pleasure to be the lowest level—eating a standard American diet and not thinking beyond the immediate sensory pleasure of eating. His second level is eating for energy—to stabilize your blood sugar, mostly because the standard American diet messes up your blood sugar. The third level is eating for recovery from weight gain due to the standard American diet, and the fourth level is eating for health. There is a low level of pleasure from choosing the yummiest thing on the menu. That only lights up a small part of the brain and minimal taste buds. There’s more pleasure in eating something you feel good about, that aligns with your values, that has a more sophisticated flavor, and therefore has many levels of pleasure. [Anthropologist Lionel Tiger] talks about four different kinds of pleasure we can apply to food: physio-pleasure, the sensory pleasure in the body, i.e., the taste, flavor, smell, and visuals; socio-pleasure, how peak eating experiences most often happen in the company of other people; psycho-pleasure, which is the psychological experience that you’re adding to the food, the memory of my grandmother, or the stories of shopping for it or cooking it; and ideo-pleasure, knowing that it’s healthy, organic, fresh, Italian, vegan, or even the idea that I’m gonna feel good when I eat this. Peak eating experiences are almost always layered with these different kinds of pleasure. K: Why did you take your interest in nutrition in the direction of being sensitive to pleasure and seeing its importance instead of the way everyone else was going? One person had a lover who wasn’t that into food, and she made a campaign to help him enjoy it more. First thing when he came in the door, she would make him close his eyes and give him a piece of chocolate and have him savor it. Eventually he started to pay more attention to food and even learned to cook. K: Can we teach ourselves to take more pleasure in eating? N: Yes, by slowing down. 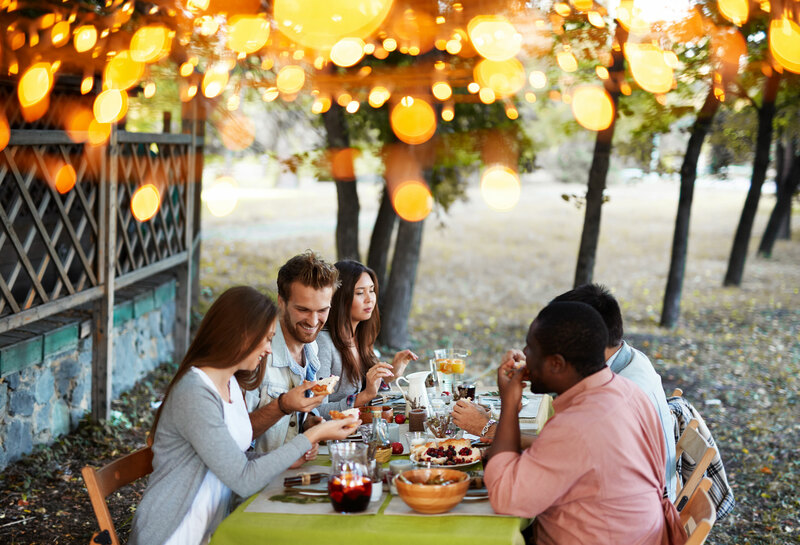 Mindful eating is talked about a lot in the meditation world: learning how to relish your food and thinking of its connection to other people and beings. You slow down, use all your senses, and set the intention of getting as much pleasure from the food as you can. K: I’ve heard you say that we get more nutrition out of our food if we enjoy it more. N: That’s right. A lot of eating is about enjoyment and there’s nothing wrong with that. When we eat food we enjoy in a happy, relaxed state, the body absorbs more nutrients and we feel more satiated. There was a fascinating study done in the 1970s. The researchers had a Thai lunch and a Swedish lunch with Thai women and Swedish women. They measured their blood iron levels a specified amount of time after the meal for optimal absorption. The Swedish women liked the Swedish lunch and the Thai women liked the Thai lunch, and both groups absorbed nearly 100% of the nutrients. When they switched the lunches, the Swedish women thought the Thai food was too spicy and weird, and their bodies absorbed less iron from it. The Thai women thought the Swedish food was bland, and they also absorbed less. Then they took a step further and pureed both the meals [each group getting each meal on different days]. Both groups’ absorption went down to five or ten percent, even though you’d think mechanically the food might be easier to absorb. The researchers didn’t say it, but not savoring, not chewing, or feeling aversion to what we eat doesn’t help our digestive juices flow. Whereas when we feel pleasure, we’re secreting saliva, our bodies break things down, and we absorb more nutrients. K: It sounds like pleasure matters to our body. We can eat what seems like a healthy diet with all the nutrients we need but be malnourished because we’re not getting everything out of it when we’re not eating it with enjoyment. Which brings me to the question: Can you give us a seasonal recipe for peak eating experience? N: Okay. Go to the farmers’ market and get a basket of Swanton strawberries. Their strawberries are grown by the ocean, so they’re a little ocean-kissed. Set them in the sun to let them get warm, get some crème fraîche—ideally you make it yourself—and some real, organic brown sugar. Take a strawberry and meditate on how wonderful it’s going to be. Then dip it in crème fraîche, roll it in brown sugar, and let the juices drip down your arm as you eat it. I can almost guarantee it’s going to be a peak eating experience! Do it outside on a summer day, sitting in the grass … [or] with a loved one, naked … in a hot tub. And you’ll experience food-gasm. Of specific foods [for peak eating experiences], strawberries were mentioned several times. Do you know what was mentioned most often? C: How many people have even tried sea urchin? N: I don’t know, but those who have eaten it remember it. Some other foods were more humble or obscure. C: No one mentioned oatmeal, did they? N: Yes … biodynamic oats … from a biodynamic farm. They said they laughed while they were eating it, like their mouth was full of sparkles. K: One last question for you. Do you think our pleasure is trustworthy? N: The desire to take pleasure in food is the desire to live. We eat in order to survive. We have to be careful in how we’re meeting that pleasure, going for the higher orders of pleasure and adding to those layers, taking in the meaning, the sourcing, and the context. We’re hardwired to respond with pleasure to food. We enjoy things that are good for us. We’re hardwired to find pleasure in the sweet, in mother’s milk, in salt—a necessary nutrient—and in the umami that’s in protein foods and fermented foods. Pleasure is there for a reason, to help us survive … and thrive. Physio-pleasure: the sensory pleasure in the body, i.e., the taste, flavor, smell, and visuals. Socio-pleasure: how peak eating experiences most often happen in the company of other people. Psycho-pleasure: the psychological experience that you’re adding to the food, the memory of my grandmother, or the stories of shopping for it or cooking it. Ideo-pleasure: knowing that it’s healthy, organic, fresh, Italian, vegan, or even the idea that I’m gonna feel good when I eat this. Find Nishanga Bliss and her “blog on food, nutrition, and sustainability” at gastronicity.blogspot.com. This interview was published in Edible East Bay on May 14, 2016 in Summer 2016.